Discontinued item. Available until 12/2019. The HVAC relay insert has a non-isolated 230 V switching channel (Channel 1) for switching the lighting and another switching channel (zero-voltage Channel 2) for switching a second mains phase (no SELV voltage), e.g. for a fan or a heater. Delay time of Channel 2 can be set to one of five levels. 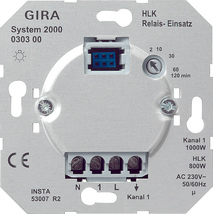 The functionality of the HVAC relay insert depends on the top unit used. This function is achieved e.g. with a System 2000 top unit for switching and dimming or with a radio top unit for switching and dimming. Channel 1 is switched on or off during operation without delay. Channel 2 is switched on or off time-delayed depending on Channel 1. This function is achieved with a System 2000 Comfort automatic control switch top unit or System 2000 Standard presence detector top unit. Channel 1 is switched on depending on the ambient brightness when motion is detected. When motion is no longer detected, the channel is switched off after the expiration of the delay time set in the top unit. Channel 2 is switched on immediately or time-delayed when there is motion in the detection field. The ambient brightness does not affect the switching of Channel 2. When motion is no longer detected, the channel is switched off when the delay time set in the insert expires.